Tears, Trifle, Thanks and Thirteen Point One. The comedown from the NYC trip of a lifetime/dream come true was way harder than expected and suddenly it was the holidays - which we will get to in a minute. 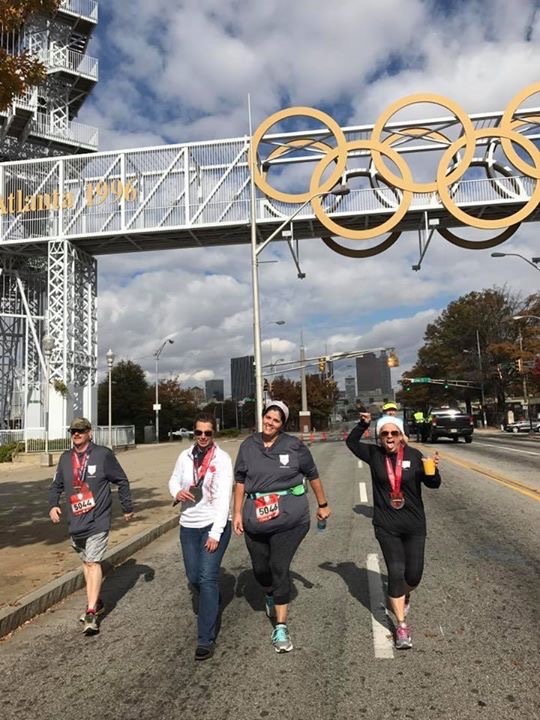 Somehow, due to coaching and people being in and out due to injuries, I ended up being the rabbit for my 12 minute half marathon training group who were running 13 miles On Saturday. That means I've done a full and 2 half marathons in one month. It's been absolutely necessary for my sanity however. I've been okay as long as I keep moving. The minute I stand still is when it gets hard. I was making my thanksgiving trifle and tears were falling into the vanilla pudding as I stood and stirred it. It has to be constantly stirred so I had no choice but to stand and stir and deal. I was just plain old mad Thanksgiving eve. My best friend and my biggest helper wasn't there. I had to get the kitchen aid mixer out of the basement and take out the recycling and feed the dogs and put all the stuff in the car and the endless list of crap that needed to be done. I had a sink full of dishes and no one to clean them so I just left them and went to the bar. That worked for a bit but then I had to run a half marathon really early with a bit of a hangover! The Thanksgiving half is one of my favorites (it was my first half!) but this year was extra special since a few of my favorite trainees were becoming first time half marathoners. We have a tradition of staying and tailgating until the last person finishes. I can't think of a better way to spend my thanksgiving morning than that. Of course it's also a great 1,300 extra calories I can consume - specifically beef tenderloin, mashed potatoes and LOTS of champagne. I had dinner with my friends and neighbors and it ending up being a great day. It's the regular days that I think about Ali the most. We would have had a lazy morning and then eventually wandered to the bar and then probably got a pizza and watched a movie. Instead I paced around the house sort of working but not really doing anything. Just lost. The down time is something I'm just going to have to suffer through because there's not an immediate solution other than finding my new normal. I can't fill the emptiness with food. I can't run ALL the time nor can I drink all the time. There has to be a balance of that somehow. Saturday I ran and ran and ran. On my own with music (Hamilton!!) but no watch. I had no idea how far I was going or fast but it felt awesome and it was a beautiful day. Training is over through the holidays but I still have plenty of races on the calendar in December. Sunday I went to the top of Kennesaw mountain with my besties and did my first real attempt at a trail run (truthfully it was mostly power hiking rather than running but I did manage to run some!) I have a trail half marathon coming up in January and it was REALLY hard but we were with seasoned trail runner so I learned a lot had a great time. This was a super long way of saying that in a year where it's sometimes been a challenge for me to be thankful, I'm thankful that my body has let me continue to be a marathoner and that I'm constantly lifted up by my friends and family.